This Blue Bay vacation villa offers visitors to Curacao a genuine home-from-home experience. For comfortable, detached, single story living, you won’t find anything more appealing than this Blue Bay vacation rental. Lying just 150m from the beach, Villa Duschi is the perfect base for sun worshipers and avid divers alike, while the clean, contemporary interiors and delightful L-shaped veranda make time spent in the villa a pleasure in itself! There’s comfortable accommodation for 6 people, across 3 bedrooms – two doubles and a twin. Each of the doubles boasts an en-suite bathroom, while the twin is served by a convenient washroom, equipped with a toilet and handbasin. Each bedroom includes silent inverter air-con, making it easy to sleep through the warm Caribbean nights. The recently decorated interior includes tiled floors – blissfully cool underfoot, painted timber ceilings, and attractive wooden furnishings. The space flows beautifully between the entrance hall, kitchen, and living area – all open-plan, family-friendly spaces, but the eye is drawn outside to the stunning veranda that wraps around 2 sides of the villa. Sitting out on this shaded, wood-decked haven is the perfect way to pass the evenings, while the 6-seater dining table makes it easy to enjoy breakfast and meal times in the open air. Villa Dushi is equipped with a wide range of amenities, designed to ensure that the needs of guests are met in full. On arrival, you’ll find a bottle of wine, ice-cold beers, and non-alcoholic beverages to welcome you to the villa. The kitchen is equipped for making simple meals and snacks, and includes an electric table grill, induction cooker, microwave, coffee machine, electric kettle, blender, and toaster. All guests are provided with a few necessities such as sugar, spices, dressings, coffee pods, vials and trash bags. Other basics such as towels (both bath towels and beach towels), hairdryers, and hand soap are all provided, as are a small selection of books, and children’s toys. For an additional $45 USD, a cot and high chair can be included. You’ll have no need to feel out of touch with the world, thanks to the Google Chrome TV and fast Wi-Fi, while the combination of US and European power outlets (at 110v and 220v respectively) means that you can use/charge your own devices easily. Electricity (up to 30kWh/day) and water (up to 2m3/day), are covered by the rental fees, and these allowances are sufficient in the vast majority of cases. 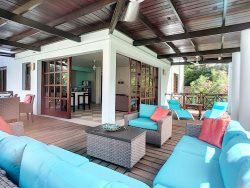 Villa Dushi is nestled in ‘The Village’ - an attractive and family-friendly complex of villas within the Blue Bay Beach and Golf Resort, on the south-western side of Curacao. The resort itself is home to a hundred-and-one things to do – from lounging on the beach, to swimming in the enchanting waters of the Caribbean Sea. Back on shore, the nearby tennis courts, communal pool, kids’ club, and 18-hole golf course mean that every visitor will find something to occupy their time. Lovers of fine food will be drawn to the resort’s choice of restaurants, while ‘culture vultures’ will appreciate being near to the capital, Willemstad, and its rich array of historic buildings dating from the island’s distant past as a Dutch colony.